Protecting Workers from UV Radiation. 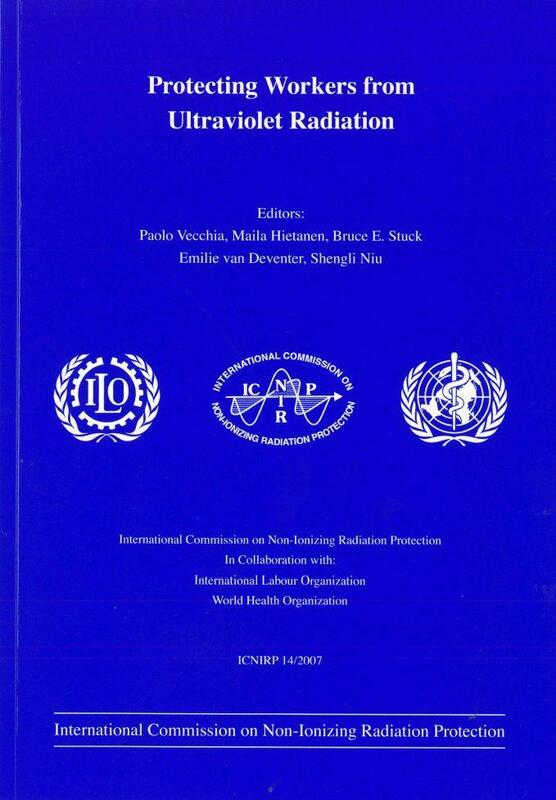 Munich: International Commission on Non-Ionizing Radiation Protection, International Labour Organization, World Health Organization; 2007. ISBN 978-3-934994-07-2. Content: Workers may be exposed to ultraviolet radiation (UVR) from the sun and artificial sources such as specialized lamps and welding arcs. Although indoor workers are normally protected by clothing and eyewear, the same level of protection is not generally achieved for outdoor workers. Outdoor workers receive significant exposure to solar UVR and are thereby at increased risk of the adverse consequences associated with UVR exposure. The magnitude of the risk for the skin depends greatly upon climatological factors and personal sensitivity to UVR, the latter incorporating both the color of the skin and degree of acclimatization to UVR. However, this great range of individual susceptibiity does not exist for the eye, and people of all skin phototypes are susceptible to cataract and other environmentally related eye diseases. This book provides information and advice on protecting workers from ultraviolet radiation exposure. The adverse health effects of both acute and chronic UVR exposures are reviewed, emphasizing solar UVR exposure of the outdoor worker.